I don’t know, man. What do you want me to say about yet another generic, mediocre hamburger from a big chain restaurant? Seriously: what can I say about this burger that I haven’t said about countless others? I guess I could say that it could be worse, because it definitely could be worse. I found that out very recently. 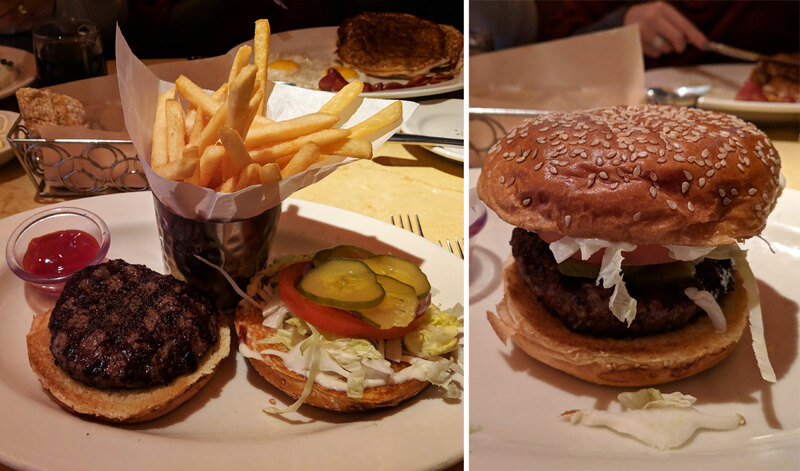 I don’t think too many people are even ordering the burger at the Cheesecake Factory. They’re known more for their heaping, super-sized portions of American comfort food, such as the breakfast burrito that weighs in at a comical 2730 calories, and of course the eponymous cheesecake. And even if people are ordering the burger, they’re probably ordering the more elaborate concoctions, such as the one topped with mac and cheese, or the one filled with gooey cheddar. I, on the other hand, ordered the Old Fashioned, which comes topped with a very basic assortment of lettuce, tomato, onion, pickles, and mayo. The waitress asked me if I wanted it cooked to well done or medium well. Since the burger at a place like this usually comes cooked to well done by default, I appreciated that. I asked for medium well, which was nice because I suspect that the burger otherwise would have been quite dry, but it was actually able to retain some moisture. Otherwise? It wasn’t bad, I guess. The texture was okay and it had a nice bit of char from the grill. It didn’t taste particularly beefy, but it didn’t taste bad, either. The soft bun was okay, too. The whole thing was fine. It existed and I ate it and I’m not mad about it. I guess you can’t ask for much more than that at a chain like this. As for the fries, they were also fine, but they were pale, lifeless, and personality-free. Are you familiar with Shake Shack, the very popular chain of New York-based burger joints? Someone at Burgers Park sure is — the style of burger, the paper wrapper it comes in, the crinkle-cut fries, the hot dogs, the milkshakes, the logo, and even the faux-park setting (the original Shake Shack is in Madison Square Park in New York) are all Shake Shack through and through. BlogTO’s profile of the place states that the owners claim that the similarities to Shake Shake are coincidental. Anything is possible, I suppose, but if that’s a coincidence it’s like the winning the lottery of coincidences. Feels like a long-shot. But don’t get me wrong: I’m not saying this is a bad thing. Shake Shack is beloved. If you’re going to steal, steal from the best. We’re never going to get a Shake Shack location in Toronto, so we may as well get a homage. And it’s really good! If it hadn’t been great then the whole thing might have felt sad, but clearly, Burgers Park is ready to roll with the big boys. I ordered the Park Burger, which is a classic griddled cheeseburger topped with lettuce, tomato, sauteed onions, and dijonnaise. The patty is great. Like the one at Gold Standard, it’s cooked with mustard on the griddle, but unlike that one, the mustard flavour isn’t overbearing. There’s just enough of it to compliment — but not overwhelm — the beef. I wish the flavour were a bit beefier, but it’s otherwise pretty much perfect. The crust is dark and impressive, the grind and the texture are exactly where they should be, and it’s prodigiously juicy despite being cooked all the way to well done. The toppings are all great, too, particularly the gooey American cheese and the griddled onions. The onions probably either needed to be cooked a bit longer or sliced a bit thinner, but they were still quite tasty. I think griddled onions might be the perfect burger topping. There’s just something about their flavour that compliments a good burger patty so perfectly. The soft, fresh, toasted bun was also quite good, holding up to the juicy patty and the toppings without adding too much heft. As for the crinkle-cut fries, something about their flavour was ever-so-slightly off, but they were otherwise nice and crispy on the outside, with a pleasantly creamy interior. That was a pleasant surprise. 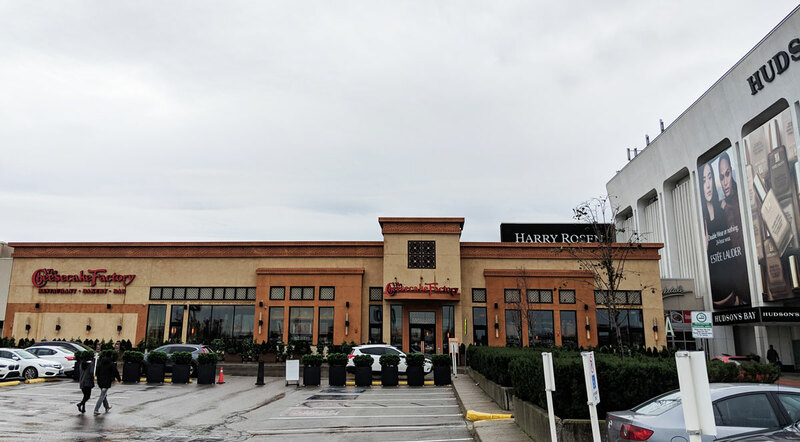 I wasn’t even planning on eating here — we were supposed to go to the Cheesecake Factory, but the wait was well over an hour despite the fact that it was before noon on a random weekday afternoon. 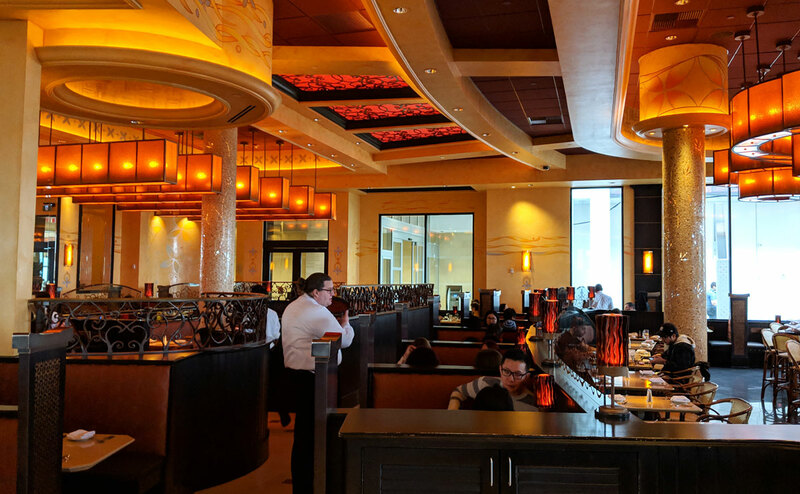 I figured those types of crowds would have died down by now, but apparently people love the Cheesecake Factory far more than I anticipated. I had a vague recollection of seeing a photo of the burger at Restoration Hardware (which is also in Yorkdale) and thinking it looked pretty good, so I figured, sure — I’m here, I want a burger, why not? Yes, Restoration Hardware — the furniture store — has a restaurant, and they serve a burger. I suppose odder things have happened. Odder things, such as the burger at a furniture store’s restaurant actually being pretty good. I was shocked at how much I enjoyed it. That’s not to say it was great, but it had a basically decent texture, it was juicy, the flavour was okay, and all of the toppings were solid. The cheese was nice and gooey and the onions were finely diced and not overwhelming. 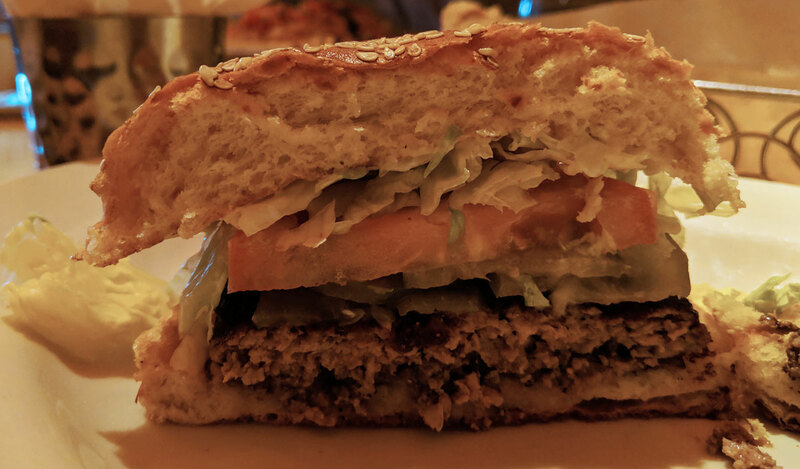 The tomato and lettuce were on the side, which is where they remained — they were completely unnecessary. It was far from perfect, of course — there was almost no crust from the griddle, the well-done beef was too dense with a slightly chewy texture, and they seasoned it with way too much pepper. But again, it’s a restaurant in a furniture store. It very easily could have been dry and tasteless and horrible, but I actually quite enjoyed eating it. As for the fries, they were even better than the hamburger — particularly when dipped in the intensely garlicky mayo that comes on the side. That stuff was potent. It actually reminded quite a bit of the garlic sauce that you sometimes get with shawarma. It bordered on being too strong, but it never went there. It was irresistible. Burger Hut is another old-school burger joint like Apache or Johnny’s, coasting by for years on nostalgic appeal and fond memories, rather than actual taste. If you opened a place like this now and served burgers of this caliber, you’d be laughed out of town. But somehow, dingy old burger joints that have been around since Johnny Carson was the king of late night are given a free pass. As I mentioned in my Apache review, nostalgia can be a powerful force. The place has two burgers on their menu: the 1/4 pound hamburger, and the 6 ounce steakburger. I sort of figured that the steakburger would be the one to get, but just to be sure I asked the man behind the counter, and he confirmed that yes, this is the better of the two burgers. I ordered, waited for the burger to be ready, and picked my toppings from behind the glass. As usual, I went with pickles, tomato, and mayo. It’s a frozen burger; it was obvious enough just cutting into it and looking at the burger’s cross-section. It’s hard to miss a frozen patty, and of course, if you’ve read my burger commandments then you know that this is a cardinal sin of burgerdom (though that really should go without saying). The burger was grilled, and though it was somewhat above average for what it was, it had that telltale frozen burger taste and chewy texture. But it also had a vaguely pleasant beefy flavour, which is somewhat of a rarity for freezer-dwelling hamburgers. It was still a frozen burger, of course, but I have had worse (I’m assuming the 6 ounce steakburger is the premium frozen burger, and the 1/4 pound hamburger is the standard, cafeteria-style frozen patty). The fries were also of the frozen variety, but they were fresh from the fryer, and were fairly tasty. They were completely unsalted, but salt shakers were readily available to rectify that omission.